In one of the early scenes of Michael Moore’s scathing 2009 documentary on free market corporate greed “Capitalism: A Love Story”, the filmmaker interviews a farmer and his wife, who are having their property repossessed. It’s recurring image in the film, the sheriff knocks on the door, working class people are thrown out onto the street with their furniture, and the house is boarded up, later to be sold for a quarter of the price. The farmer, his life packed into the back of a van, says he tried everything “except robbing a bank” to save his farm. “I’m thinking about doing that. It’s one way someone can get their money back. They did it to me. I don’t know why I can’t do it to them,” he says. Later, Moore questions how capitalism allows commercial airlines to pay pilots less than $20,000 a year forcing them take second jobs or apply for food stamps. That’s the exact sentiment I felt when reading about the multi-million dollar handouts to executives at the scandal-ridden Commonwealth Bank financial planning division. People like retiring CBA banking executive Grahame Petersen (total pay $5.6 million), who oversaw the division responsible for the systematic destruction of customer retirement savings through investment in risky products recommended by the bank’s licensed financial planners in return for millions of dollars in commissions. I thought that the retirees who had lost everything to this free market system that rewarded greed and deception could be forgiven from thinking about doing something similar to the American farmer: walking into a Commonwealth Bank branch and “asking for their money back”. This is something Michael Moore does in the documentary in his typical sardonic style, walking up to the head office of Goldman Sachs in New York to perform a citizen’s arrest of chairman Lloyd Blankfein (2013 annual salary: US$23 million), after accusing the bank of “stealing’ US$170 billion of American taxpayer’s money to save it from collapse. Later he wraps police crime scene tape around the whole building. 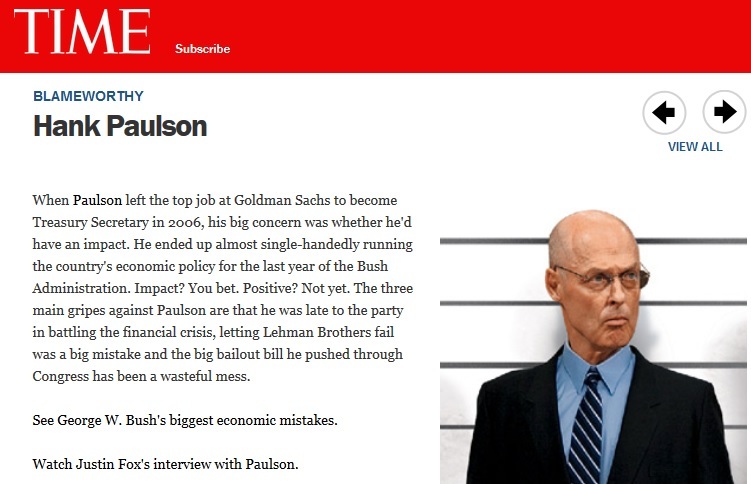 As Moore explains in the film, the bail out of the banks after the collapse of Lehman Brothers that sparked the Global Financial Crisis, was orchestrated by former Goldman Sachs CEO Henry ‘Hank’ Paulson (one of 25 people Time magazine blames for the crisis happening in the first place). The then US Treasury Secretary cut a backroom deal that gave the banks $700 billion of US taxpayers money to keep them afloat. Paulson was apparently unaware of the irony that he had broken the basic law of capitalism – that you don’t ask the government for help, you either sink or swim on your own. It seems this form of failed American style free-market capitalism – so brilliantly depicted in Moore’s film – is what the current Australian government wishes to mimic with its plans to increase the cost of car fuel, doctor’s visits and university education while Australia’s poorest paid workers earns a minimum wage that is the lowest in history relative to average full-time pay (currently $640.90 a week, or $16.87 an hour). The 3% pay rise they got this year was more than double what the The Australian Chamber of Commerce and Industry – the powerful lobbying body, which represents big business, wanted. It suggested a 1.25% pay rise, less than half the projected cost-of-living increase of 2.7%. Perhaps Treasurer Joe Hockey – a man who proves himself time and time again to be completely out of touch with most Australians – and his investment banking advisors should watch Moore’s documentary to see the longer term outcome of such policies in the US before and after the GFC: hundreds of thousands of job lay-offs, the poorest people unable to afford basic health care, the boarding up of whole suburbs and ruination of cities like Detroit and Cleveland. He tells the story of the employees of Chicago Republic Window and Door factory, who, having been told they will lose their jobs in three days time without being paid their wages lock themselves inside refusing to leave until they get what is theirs. The local community rallies around them providing food and encouragement. Then there’s the story of the Warren Evans, Sheriff of Wayne County, Detroit who decides to stop all home foreclosures, when he realises the hypocrisy of what is happening to working class homeowners after the US$700 billion hand-out to the banks. More widely, Moore reports of how Barack Obama’s form of democratic socialism has been embraced by young American voters (33%), with only 37% favouring capitalism and the rest undecided. As explained by Vermont independent senator Bernie Sanders, democratic socialism means “the function of government is to represent middle-income working people rather than just the wealthy or the powerful”. 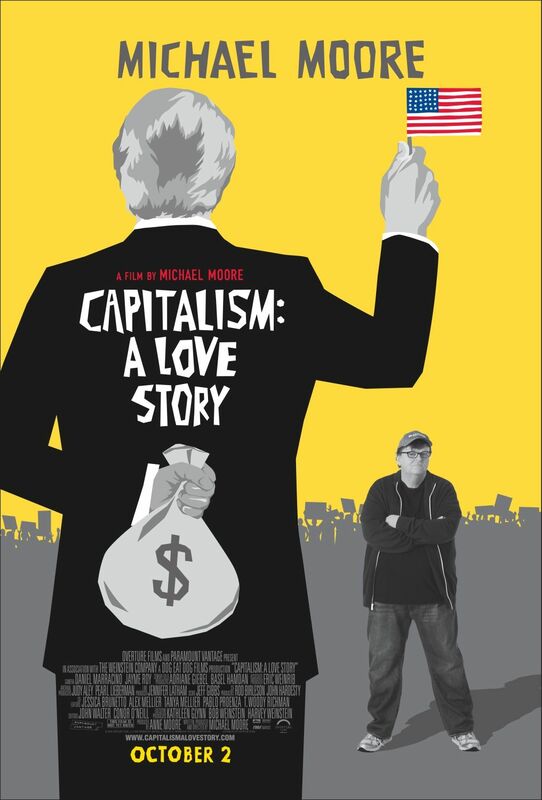 You can watch the whole documenatry ‘Capitalism: A Love Story’ for free on YouTube.